Thread by @oldladydem: "This is a disaster. There are two different plans. The resolution, a collaborative effort endorsed by multiple Dems, and AOC’s document, end […]"
This is a disaster. There are two different plans. The resolution, a collaborative effort endorsed by multiple Dems, and AOC’s document, endorsed by none of them. There’s only one solution to this mess. AOC needs to own it and separate herself from the GND. No more of this. 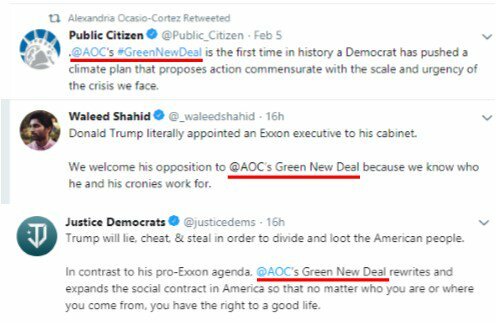 ⬇️ Drop the “AOC” and refer to the GND as what it is: a collaborative effort built on years of work done by others. 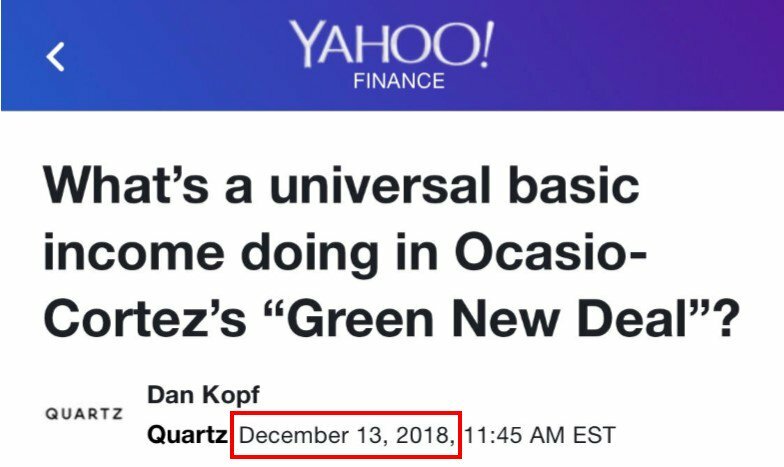 The Green New Deal didn’t originate with AOC. She admits she has no actual plan and that she wants others to put in that work. So why insist she get the credit for other people’s work? Despite all the obfuscation by AOC and her team, fact is, the blogpost was posted to her website on Feb 5 and not removed until it received backlash on Feb 7. They sent the doc, in its entirety, to NPR. Did they send an internal doc by mistake? Sure. But they didn’t mistakenly send a cookie recipe. They sent AOC’s vision of a GND and their talking points. 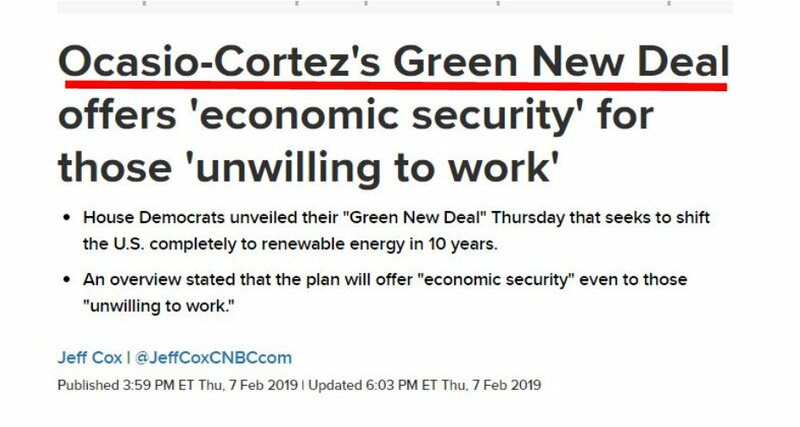 Unless *her* vision is definitively separated from the GND, it will be weaponized against Dems generally and against efforts to combat climate change specifically. 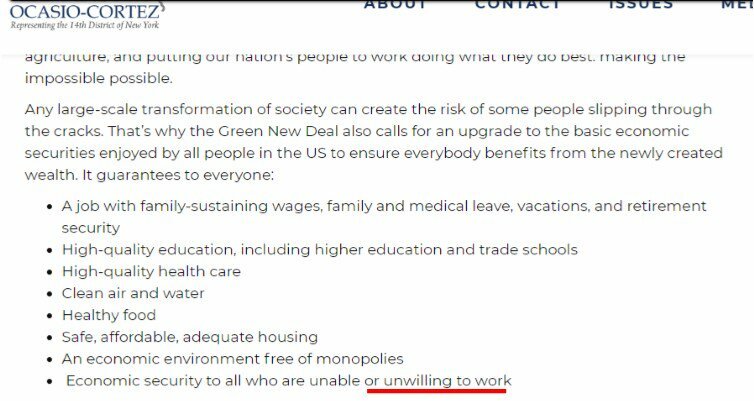 AOC always intended to include UBI in her GND. Her decision to specifically include the most unpopular and hated aspect of UBI in both her blogpost and the separate doc she gave to NPR is inexplicable if her goal is to pass any climate-related legislation. Just don't see the case for Sanders entering the primary. The issues he cares about are well represented. Most candidates who've announced, or rumored to be announcing, are *far* more accomplished than he is. Better skill sets, better temperament, less baggage. What's the case? What’s the case for the guy with the thinnest resume in the field? Admittedly, the guy who didn’t have a regular job until he was 40 and passed only one real bill in over 30 years *is* the biggest contrast to DT’s image as a successful businessman but is that a winning contrast? What’s the case for the most “unlikable” candidate in the field? 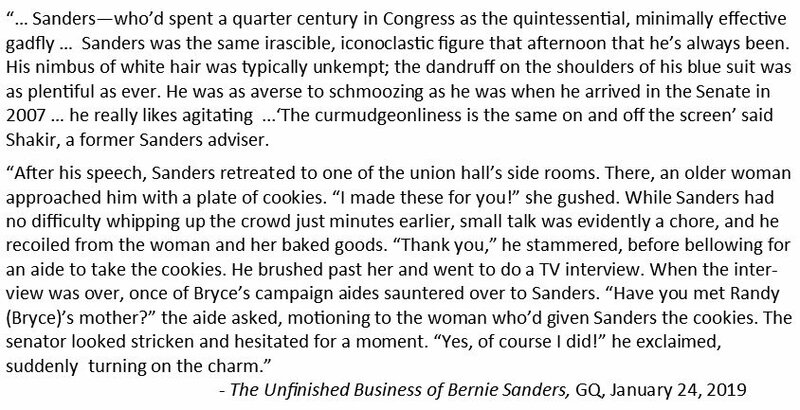 Whose own supporters call him a “curmudgeon?” Who’s commonly described as “irascible” and “prickly?” Who hates talking to everyday people? I don't understand the blind (bc we don't have details) allegiance to M4A. When you buy a piece of clothing, you look at your choices first. Why would you change 1/6 of the US economy and 326M people's HC and lives w/out doing the same? There it is folks. That’s his swan song. After he travels the country taking the temperature of a 2020 run and finds out it’s brrrrr cold, he’ll say he’s not running bc he already won. 🙄 Even though it’s a lie. He hasn’t moved the party to the left no matter how many journos ignorantly give him credit for that. The party is further left than Sanders has falsely portrayed it to be but it is what it’s been for 50 years: progressive and centered on equality and fundamental human rights. Candidates Sanders most strongly supported in the midterms and those most closely aligned with his platform lost. Over 80 new candidates ran for Congress on M4A and only 6 won, all in deep blue districts. His new book was a flop. His poll #s are falling. That’s not winning. @aoc fighting against climate change and @SarahPalinUSA chanting "drill baby drill" aren't equivalent. Fight me. Some checkist DBag proclaiming support is equally likely to be an effort to discredit as it is to support. Fight me. This is partly in response to tweets from @lauferlaw @karolcummins @luoisemench @JamesFourM none of whom I would ever fight except in the most irony-dripping twitter amusement sense because they are great, even if they disagree with me. One important thing about Aadhaar or any centralized system,particularly connected to money, which I have not said so far, is how it completely destroys any security by obscurity which we have enjoyed so far. Take the example of mobile OTP. (THREAD) MAJOR BREAKING NEWS: Mike Flynn will plead guilty to Making False Statements at 10:30 AM EST today (Friday). This is the biggest development in the Russia probe so far. This thread explains what it all means, and will be updated throughout the day. Please read and share. 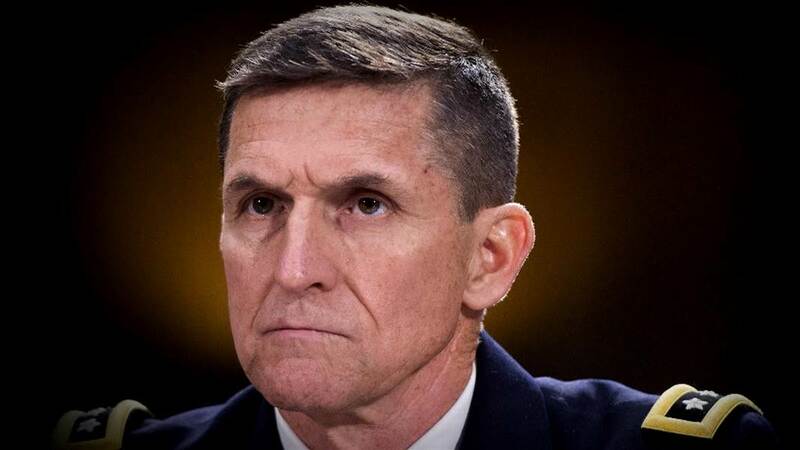 1/ First, it's important to understand that Mueller has entered into a plea deal with Flynn in which Flynn pleads guilty to far less than the available evidence suggests he could be charged with. This indicates that he has cut a deal with Mueller to cooperate in the Russia probe. 2/ We've already seen Mueller do this once before in the probe, with George Papadopoulos—who was charged with the same crime as Flynn, Making False Statements, to secure his cooperation with the Russia probe. The Papadopoulos plea affidavit emphasized facts were being left out.